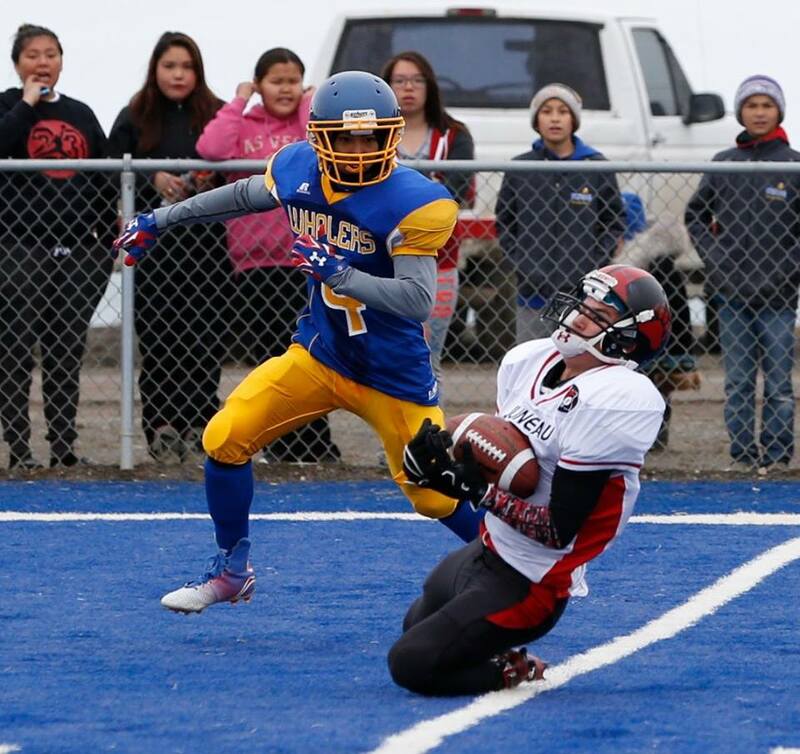 BARROW, AK – The Barrow Whalers and the Juneau-Douglas Crimson Bears got the 2015 football season underway last Saturday with a hard-fought game on the shores of the Arctic Ocean. With temperatures in the 30’s and a film crew from the NFL Network documenting every play of the game, the visitors from Juneau managed to escape with a 26-20 win – but only after a frantic rally in the game’s final three minutes. The Crimson Bears trailed 20-12 when their starting quarterback Bubba Stults was injured and replaced by Hunter Hickok, the Bears’ star linebacker who was the state’s defensive player of the year in 2014. Hickok proved up to the task, however, immediately connecting with wide receiver Devin Williams on a long touchdown pass to pull the Bears within two points. The first conversion attempt was successful, but yet another penalty flag in a game filled with them was thrown for the Bears having 12 men on the field. The second attempt was unsuccessful leaving Juneau on the short end of a 20-18 deficit with just 2:07 remaining in the game. A successful onside kick, however, led to another Juneau touchdown with less than a minute play, and the Crimson Bears would convert the two-point try and hold on for a 26-20 win in the season opener for both teams.